We call our homestead Almost Paradise. It isn't paradise because that was lost! 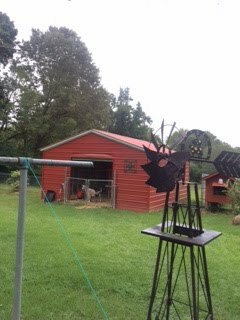 But it is almost paradise--a place with blueberry bushes, boysenberry and muscadine vines, pear and fig trees, an asparagus bed, and lots of garden space. We share our lives with six laying hens, 3 dairy goats, 2 dogs and a cat. It's a work in progress. A part of our homestead is Joy Fellowship. For now it is a Facebook page. Joy Fellowship shares a piece of our homestead; in part, it is a small garden Labyrinth. Each Monday, the labyrinth is walked and prayers are offered. (Many other times during the week, too.) We post under the tag "Labyrinth on Lunes" (Lunes is the Spanish word for Monday). Various and sundry posts are shared, too, from other sources; most are Christian but some are from other faith traditions, too. Our goal is to share Joy amidst sorrow. Joy Fellowship is more than just a Facebook page; it is our domestic church. It is the place where Morning Prayer is read, intercessory prayer is offered, the rosary is prayed and occasionally, The Holy Eucharist is celebrated. Some changes are coming to Almost Paradise Homestead and Joy Fellowship. I hope you'll go and "like" our page on Facebook. I invite you to stay turned! May the peace of Christ fill you and rule in your hearts! The days are growing shorter and darkness comes earlier and earlier. The spring and summer gardens are complete, and the few things we managed to plant for fall are being plucked daily--lettuces and greens--so fresh! We are savoring the last of our cherry tomatoes as fall settles in. Retirement is on the horizon for me now. I have been preparing; looking at the life of one of my heros: Tasha Tudor. She is known and loved by many. 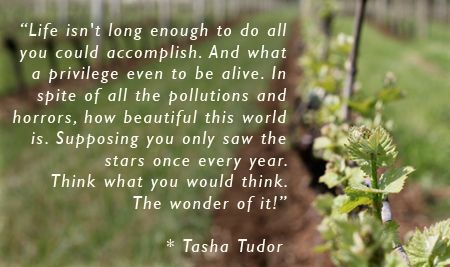 Tasha was an author and illustrator of many books; she lived a life style of simplicity with great charm. 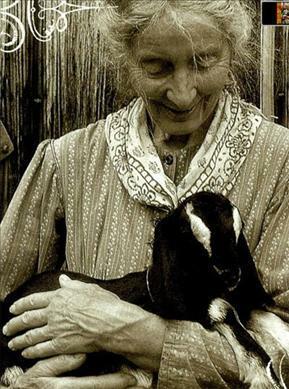 She raised goats and chickens, loved having tea, creating dolls and doll houses, and gardening--oh the gardening. Tasha lived life fully until age 92; she died in 2008. 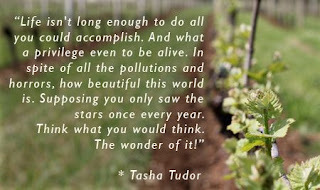 One of the things I admire about Tasha is her zest for life and living things. In her book Simple Adundance, author Sarah Ban Breathnach writes this, "...the Stillwaters, the mock New England sect imagined by author and illustrator Tasha Tudor. Stillwater followers...believe that life's simple pleasures are meant to be savored and that Nature is to be revered." Tasha's illustrations involve much of the beauty of nature. Breathnach continues, "The Stillwater religion, which combines the best beliefs of the Shakers, Quakers and Amish, is a state of mind, according to its creator. 'Stillwater connotes something very peaceful,' Eldress Tudor explains, 'Life without stress. Nowadays, people are so jeezled up. If they took some chamomile tea and spent more time rocking on the porch in the evening ...they might enjoy life more.' " Tasha enjoyed life! As I prepare for the earliest days of my retirement, I hope to take time for tea and a sit, rocking on the porch and enjoying the view of our Almost Paradise Homestead. I'm not an author; but I do sew, knit, grow vegetables, raise chickens and goats, love having tea and making dolls. The simple life is ahead; this eclectic Episcopalian is savoring the final days of my parish ministry as I prepare for the gift that lies ahead. The Stillwater religion just may be a part of my future! And a Facebook page called Joy Fellowship at Almost Paradise Homestead. Worship the beauty of holiness! # the simple life! A few months back, my husband and I took a little vacation. We enjoyed our time away and relished in the togetherness. One of our stops was in a place called A Taste of Amish. There were bulk foods, lots of different kinds of teas, homemade items, and wonderful sandwiches. Our visit was on a cold and dreary day, but we were warmed by the charm of the place. After eating lunch and on our way to the check out, I noticed the sign at the cash register. 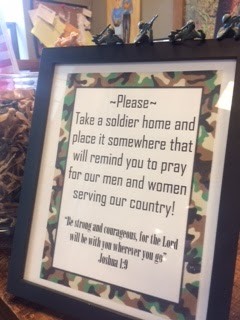 Beside it was a glass jar of little plastic soldiers--and the bidding to take one and place it in your sight as a reminder to pray for those who serve our country grabbed me. I took one--wrapped it carefully with my other purchases. 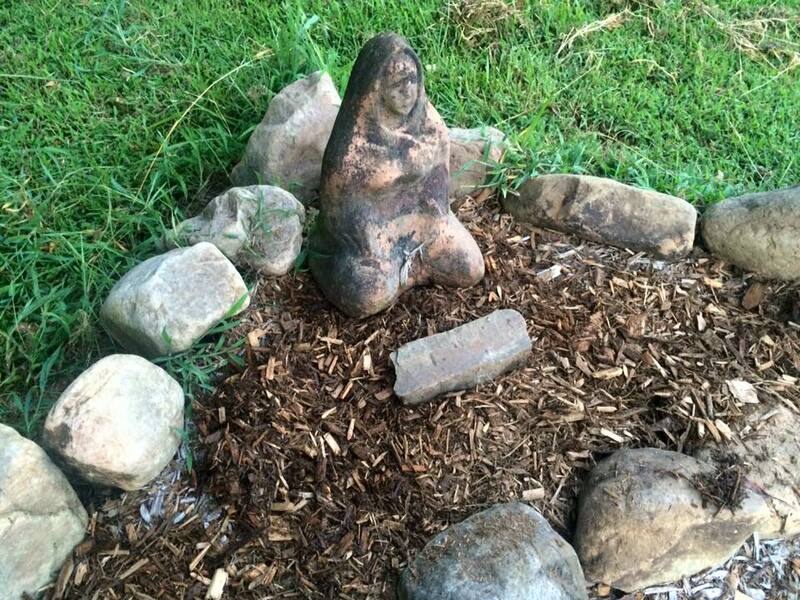 Later, when our trip was completed I unwrapped the soldier and placed it in my prayer corner. It is a little thing, but it is a constant reminder to me to pray for our American soldiers serving around the world. Perhaps others can make this offering! What if a church or business placed a jar of plastic soldiers as an invitation to prayer? If you make a trip to the Dollar Tree, a bag of these little things can be obtained for $1.00! It's a little thing--yes! But prayer is very important and our service personnel need our prayer. Join me in praying for them. Planning for the fall season and flipping through the calendar, I am noticing that September is on the horizon. With the heat of the past few days, fall will be a welcome season with its cooler temperatures and its many colors. For many people, school is already underway and in some places, startup will follow Labor Day. I love September—apple season is near! The Society of St. Andrew has many resources for you to develop a plan of action. Their 2017 Calendar of Prayer and Action is chock full of sound, biblical responses to helping to end hunger. If you attend St. Peter’s Episcopal Church in Oxford, MS, see me; I’ll be happy to make a copy of the calendar for you. The calendar can also be obtained from their website. Families may find the Society of St. Andrew’s coin boxes a helpful aid in sharing the problem of hunger with children. These, too, may be obtained online, or you can make your own “bank” for coins. Perhaps if you treat your children to a child’s meal at a fast food restaurant you might put in the same amount of money into the money box/bank to donation to help end hunger. May your September be one of blessing. May it also be one of prayer and action. Get a calendar, fill your coin box/bank, and offer it to God on Sunday, October 1, which is World Communion day. Then, count your coins and send a check to the Society of St. Andrew to aid in their work to end hunger. It is the beginning of August--where has this year gone? School begins for our local schools tomorrow! Have already seen Halloween decorations in the stores! 2017 is going fast. Faster than I'd like. And change is in the wind. The times are changing. My retirement has been announced. I'll be retiring in February of 2018. 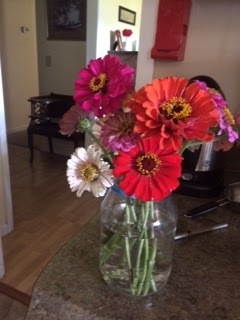 It is bittersweet; the new embrace of life on the Homestead with my husband is so inviting! But the laying down of active ministry has my emotions stirring. How difficult to lay down the relationships--even temporarily. In some sense it is a protracted slipping away, and yet how quickly February will arrive! Seize the day! Make the most of the time we have together! My head and my heart will come together. And I'm thinking of a new name for this blog. Oh, I'll always be that Eclectic Episcopalian! But perhaps a name that may be more reflective of my new role in retirement--as I continue to discover what that means for me. I invite your thoughts, should you care to share them. Wife, goatherd, gardener, collector of things that make me laugh, maker of dolls--these are among the things that will be a part of my life. I hope to be a much better neighbor--and a friend! Mostly, I seek to be a child of God embracing this new step--even as titles and blog names may change! Dreaming! 2017 is blowing through--and along with it, change is in the wind. Thank you God for such rich, golden years as a priest in your church! 2016 gone . . .thank goodness! 2017 here ...let's make it a good one! And I hope to be back writing my very simple blog about life! Chosen word for this year: Purge--hoping to focus on "letting go!" 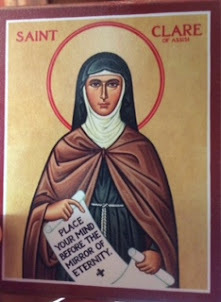 Chosen Saint for 2017--Hildegard of Bingen--she still inspires me!